If so, it was off by one post, because I didn't have sour cream, which looks essential to the cheese bread recipe. What ended up catching my eye was Susan's Savory Cheese and Scallion scones, for which I didn't have cream cheese. 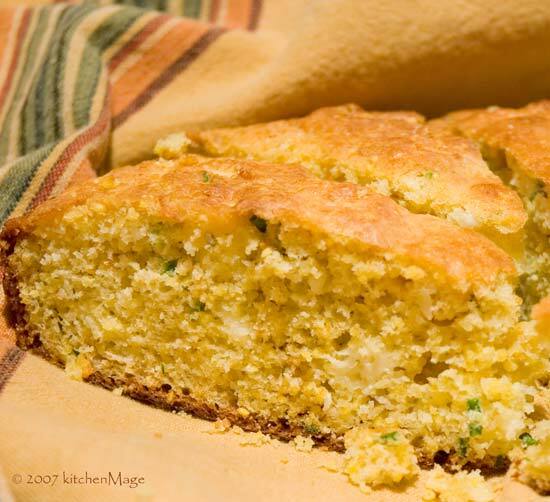 Taking my inspiration from Susan's scones and applying it to my original idea of cornbread, I came up with feta and chive cornbread (because I didn't have scallions either!). Baked in a preheated cast iron skillet, this came together in minutes and was ready to eat in under an hour. Which is about how long it takes to heat chili, make a salad and clean enough of the dining room that you can eat at the table. Oh yes, the chili. The hot+ chili. I mean the georgeHot chili. It's enough to make a mage glad there was a lot of cornbread. 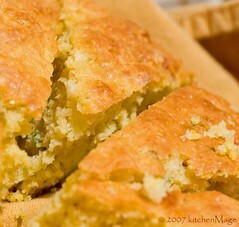 If you are making this cornbread in a cast iron skillet or similar heavy dish, and I do recommend it, place it in the oven while it preheats. Otherwise, grease a 10" round pan and set aside. Place flour, cornmeal, salt, sugar, baking powder and baking soda in bowl and stir to combine. Add crumbled feta cheese and chopped chives and toss gently to coat. If you are NOT using a preheated baking pan, melt the butter, let cool a bit and add to liquid ingredients. Add the liquid ingredients to the flour mixture and mix gently until just combined. If you are using a preheated pan, cut the butter into several pieces and toss them into the hot pan just before adding the batter. Otherwise, just add batter to pan and place in preheated oven. Bake at 450° for 25-30 minutes, until golden brown. Turn out onto rack to cool for a few minutes before serving.